Excellent manufacturing technique and strict quality control means. There is stable capacitance with little variation due to temperature. 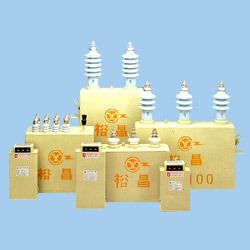 High-insulation plastic films make capacitors stable and durable with higher coltages. 5. Adopt non-polluted insulation oil, unharmed to human being, animal, and environment. 6. Built-in discharge resistor, safety assured. 1. Standards: in accordance with IEC 871 and CNS 1372,3739. 2. Ambient temperature: -20℃ ~ +40 ℃. 3. Capacitance tolerance: -5% to +10% (phase-to-phase tolerance within 3%). 4. Maximum working voltage: 110% of rated voltage. 5. Maximum working current: 135% of rated current. 6. Losses: less than 0.1%. 7. Discharge characteristics: after the capacitors are disconnected from the power source, the residual voltage drops to 50 volts or lower within 5 minutes. 8. Sealing test: no leakage on capacitor surface 80℃ for 4 hours. 9. Temperature rising: below 20℃ when ambient temperature is 35 ℃.